Poll: what was the best Android smartphone of 2018? The end of the year is fast approaching. Christmas lights are everywhere. Supermarkets are full of toys. The turkey and mince pies are ready. It is also time for a retrospective - taking a look at the developments 2018 brought with it. This year has been a year of endless announcements in the smartphone market. 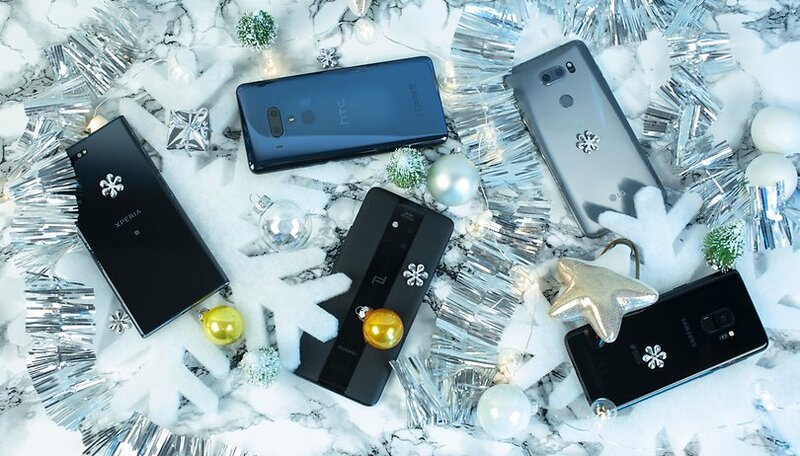 That's why we want to ask you which Android smartphone captured your heart in 2018. Certainly, 2018 has not marked a technological revolution. Folding smartphones and pierced screens will arrive next year, but this one was still quite rich in announcements and surprises. While Samsung initially consolidated its status as the world leader with its Galaxy S9 and S9 Plus, we also saw Huawei compete strongly with the P20 Pro and Mate 20 Pro releases. Chinese brands, in general, have an increasingly strong influence on the smartphone market. There are also more and more manufacturers to mention these days. The arrival of OPPO and Xiaomi outside of China is evidence for this. However, 2018 was also a difficult year for manufacturers seeking to regain their former prestige. Among them are LG or HTC, who struggled quite a lot this year. I therefore invite you to participate in our major survey on the best Android smartphone of the year. Of course, the list is not exhaustive. If your favorite is not on there, you are welcome to let us know in the comments below and start the debate. What do you think is the best Android smartphone of 2018? So, which smartphone did you vote for and why? Used some of the phones in the list for a test (my own personal phone is a Pocophone F1), and I have to say, the Note 9 is a clear winner, with Mate 20 Pro just behind it. This year I bought the Huawei nova 3e (20 prolite) as I am sick paying Apples prices. Bought this phone just to see what it was like and I've been blown away with it. I had iPhone 6s before and wow this Huawei mobile is just amazing for the price. I am choosing Huawei / Honor (pick your favorite device from either) because they seem to comprehend giving me an option - affordable OR expensive! Please read up on the subject. It has LITTLE to do with the just the chip. It's just a case of the pot calling the kettle black, blown out of proportions. Fact is, the U.S. is accusing Huawei of being a security threat solely based on 2 facts: 1. Huawei's founder was once in the Chinese army, 2. Operation Shotgiant, which makes the U.S. government very hypocritical since they hacked Huawei in the first place. Still.... despite of 6" inch or bigger screens, triple camera's, hidden fingerprintscanners, fancy eye scanners, I still love my Samsung S5+ G901F with Lineage OS installed trough XDA-website and Forum. It does what I need to do, has removable battery, good-enough camera since I don't print the pics I take with telephone, so all that fuzz about more megapixel does not apply to me, can make calls (duh..), and the size, weight and looks are still competitive to most models out there today. Please can you tell me how many Android version updates did you receive from Samsung. Thanks. I get security updates every month on my Note 9, which is the clear winner in this poll. I'm not sure I understand the obsession by some people to be on the latest version of an OS. What features are so important that it's worth being on the bleeding edga? @Bruinguy. Let me explain it like this. A Samsung is like driving a lambo with 13 inch wheels on it. You can drive it but can't make use of it's full potential. Another example having an i7 pc and installing win xp on it. Using old firmware is like 13 inch wheels or xp in my opinion what's the use of having the latest hardware but with old outdated firmware? While others have new ui's you are still stuck on an old one. Bugs that have been fixed in the latest firmware in this case pie haven't been fixed on the 8.0 version of oreo. And I don't believe that samsung's 8.0 version have been updated to 8.1 and that they just call it 8.0 story. Why then have some of their other devices been updated to 8.1 think the A-series devices if I remember correctly. Just my opinion about samsungs firmware not to mention taking almost a year to update their devices from the year before paying a huge amount to be neglected the next year. Due to my own carelessness, I have been thru several phones in the last couple years. When I broke my Note 4 I decided there had to be cheaper options than paying $850+ at the AT&T store. I first picked up a Huawei Honor X5 for which I paid $250 and sold to a friend a year later when I decided that it was too slow for me. I next got a used Huawei honor 8 for $250. This was a great phone for my uses; fast enough to not have any delays, and with a good camera. I broke that one too and bought a used Mate 9 for which I paid $350. When I broke that one I got a Mate 10 for $500 new. Super fast with great camera. I have started using better cases and have vowed to NEVER put my phone on the roof of the car ever again! Please can you tell me what was the cost of Note 4 when you bought it and how much would it have costed to repair it. Thanks Sir. I think I paid around $850 for it, which was the going price for a top tier phone at the time. Repair would not have been possible. I left it on top of the car. It landed in the road and was run over before I could get to it. After giving up on Blackberry I bought my first Andrdoid phone. It was a Nexus 5. It got wet and died after more than 2 years. I really liked the phone, it was a good size and had a pretty good camera. When it died I bought a Moto X Pure Edition. It was way big, too big at 5.7", but the software experience was very good and it had a great camera. Its Android is pretty much bare bones with the nice touch of the shake and twist actions... unfortunately I dropped it on a corner, even with a good case and it died. I have tried a iPhone 7 for going on 6 months but I don't like the experience...I liked the size of the phone but not the iOS. I do not want a huge phone. I would like a phone at under 5.5" but maybe with a thicker case to give it a bigger battery. So many new phones with power and good design are just to big and 18:9, and come on, it makes the phone so tall. Why can't the manufacturers get it that there is a market for small or mid sized phones that don't take up so much room in a pocket or purse and still have power and speed!! Most of the recent Huawei phones have at least 4000mah batteries, which makes them last all day and more. I have been very please with my mate 10 pro. The camera, screen, battery life are all excellent. It was also rated the same score in a recent Consumer Reports review at the time as the new iPhone X, and for half the price. I know I sound like a fan boi, but I am not affiliated with them in any way and have not gotten any compensation for any of my reviews. Motorola makes a quality 5.2 screen size device (Moto Z3) now on sale at their website! Pixel 3 XL. Undeniably the best camera, Google Assistant integration, all buttons on one side, pure Android experience with no bloatware, works best in Google ecosphere, where I live. This said, Samsung's flagship phones are beautiful, but the Samsung garbage apps, Bixby, etc., can't be completely removed. Sir suppose we install Nova Launcher with Pixel Icon pack, disable or hide duplicate Samsung apps, use pixelized theme.... then would it not tantamount to a Pixel like stock Android experience on Samsung's hardware? No. I had the S9+ before the Pixel 3 and did all of this, and more, but Samsung simply won't let you remove everything. I thought the S9+ was the best phone (hardware) I've ever owned, but I honestly wouldn't trade my Pixel 3 XL for ten other phones. Thank you 😊😊😊 Have a great day. If having the hardware is more important than having a pure Android experience, you can get close. But you just can't have a pure Android experience without a Google phone. The difference between the "best camera" and second best camera is just so minimal these days. The well documented issues with Google's niche phones aren't worth the reward of the camera. If you're a professional, or even experienced, photographer that simply isn't true. If you only casually take pictures, then I agree. Also, I went from a Galaxy S9+ to the Pixel 3 XL and you couldn't pay me to switch back. I haven't had one problem with the Pixel. The best phone from the above is and will, in all respects, Huawei Mate 20 Pro. Returning to Earth (! ), However, the best phone remains the one that you can afford to buy it, the one that you use day and day and that is perfectly functional, is the phone that you still get rid of, but which still it goes, it's the phone that sounds in inappropriate moments, it's the phone... it's even your phone! Any other top of the phones is just to make a Top, a ranking of possible phones, possibly not even the phones that you would like. There are fantastic powerful phones with countless features that you can barely use. That's why "your phone" is the best of all phones. I personally have a Huawei Y6 2018, that I am completely satisfied with. How has been your experience with Huawei's custom EMUI? It is quite different from Stock Android. Do you like it? I'm still using my 2015 phone (BLU Pure XL) -- still does much more than I need it to, and is faster than my brain. But come 2019 and 5G capability, I will think of moving up. You have to grant it to the makers they all do a wonderful job we all get a great phone, we have just got a S9 been watching video's tips & trix and what it can do wow! I haven't a hope of remembering no hope of using it to full potential, it's quick! and no stupid notch. I can't wait for the S10 by all reports!! I hope it is priced for everyone can own it. Cheers. Love ya article, Pierre. None of the above, the last good phone was the LG V20, the last great phone was the Samsung Galaxy Note 4. Everything else is all hype and gimmicks, with planed obsolescence at it's core. I use the s9+ with the #1 reason for me is the display. But my vote goes to the note9. It does everything very well. The swiss army knife of any! @David just think if macguyver had a few note 7's in the 80's he wouldn't have needed a swiss knife. Just a thought. Totally agree Mark still using my LG daily. Bought a nokia sirocco a few months ago as a second device for personal use to check them out and see for myself all the hype about android one.